Haihaisoft Reader is a free PDF document Reader and Printer, extremely fast launch speed and rich feature set. It is also for reading PDF document protected by DRM-X platform. It is now available for Windows, Mac, Android, and iPhone/iPad. Requires iOS 6.1 or later. Read PDF: Read, Print all Adobe PDF documents and open protected PDF documents by Adobe Acrobat. Very small size: The download size of Haihaisoft Reader is only 3 MB which is a fraction of Adobe Reader. Speedy launch: When you run Haihaisoft PDF Reader, it launches instantly without any delay. It saves your precious time. High security and privacy: We know security and privacy are very important for you. 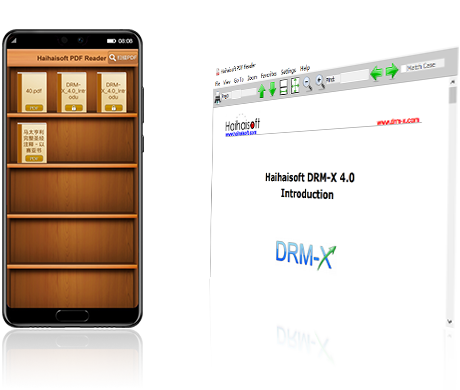 Haihaisoft PDF Reader highly respects the security and privacy of users and will never connect to the Internet without users' permission. For protecting your privacy, Haihaisoft PDF Reader doesn't connect to the Internet in the background for updating. You just need to check version and update the software by single click in the Help menu. Read protected document: It supports protected PDF document by DRM-X platform. With DRM-X platform everyone can easily set different rights permissions and securely share your document. How to protect PDF document? Support XPDF file (Added relate with XPDF format). Improved the DRM function with time limitation. Nov 17th,2008. Check here to protect your PDF documents.